This technical note, therefore, is written to help ensure the best handling and use of seeds in development work. It will answer questions about seed grow-out, storage, seed germination testing, and useful publications. 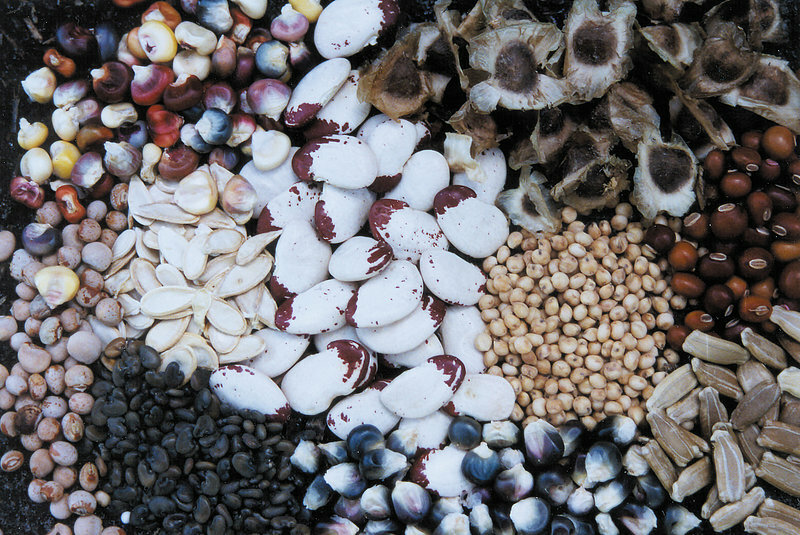 The content in this section focuses on foundational concepts and basic steps in planting and growing out an existing crop variety for the purpose of seed saving. For this reason, the term “seed grow-out” is used instead of the more inclusive term, “seed production”, which includes subjects such as plant breeding methods and seed certification procedures that are outside the scope of this technical note. It is assumed that the development worker has made sound decisions as to which crops to save seeds of and promote to farmers. In this regard, ECHO encourages small-plot, field experiments to help identify suitable crops for a given area. For information on a practical model of experimentation, visit www.ECHOcommunity.org to access an ECHO technical note entitled “Small Farm Resource Development Project.” Additionally, when working with crops already being grown in a specific area, take into account that farmers have likely been selecting and saving seed of these crops over a long period of time, resulting in local varieties that are already well-suited to the conditions and may benefit farmers in neighboring areas. Figure 1: Seed structures using seven-year lima bean (Phaseolus lunatus) as a model. What is a seed? The literature contains numerous definitions, some of them very technical. Basically, though, a seed is a plant embryo surrounded by a seed coat and supplied with food reserves (Fig. 1). Knowing the function of the various structures contributes to proper seed handling methods. The seed coat, known as the testa, protects against pathogens and insects; avoid damaging the seed coat in threshing and cleaning seeds. In storing seeds, keep in mind that the embryo, made up of a plumule and radical, is alive. Harvesting mature seeds will ensure that the seed contains sufficient food reserves for high seed vigor. In dicotyledons, such as beans, food reserves are stored in the cotyledons; in monocotyledons, such as maize, it is stored in the endosperm of the seed. Self-pollinated crops have complete flowers comprised of both male (stamen with anther/ filament) and female (pistil with stigma, style, and ovary) parts (Fig. 2). In a self-pollinated crop, the pistil and stamen mature at the same time, and the pollen on the anther can easily reach the stigma. Often the male and female flower parts are encased, and pollination occurs within the flower itself. Though insects can transfer some pollen between plants, there is little likelihood of pollen contamination from neighboring plants. Figure 3. 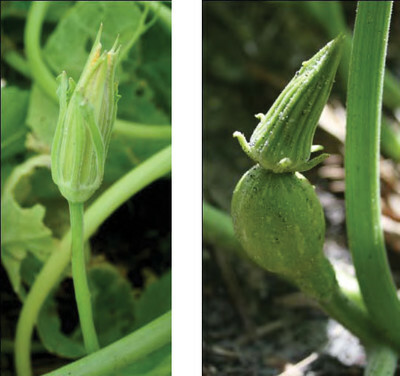 Photos of cucurbit flowers illustrating a male (left) and female (right) flower. Cross-pollinated plants rely on wind and/or insects to transfer pollen from the anther to the stigma. Insect pollinating agents are usually bees, although other insects can also serve as pollinators. Practices that contribute to a healthy population of pollinating insects can be a key factor in succeeding with cross-pollinated crops. Cross-pollinated crops may or may not have complete flowers. Those without complete flowers (and some with) will have male and female flowers. Some are monoecious, with male and female flowers occurring on the same plant. A prime example of this is the cucurbit family, with cucumber, squash and pumpkins (Fig. 3), the vines of which have a number of flowers with each flower either male or female. Other cross-pollinated crops are dioecious, with male and female flowers occurring on different plants. Dioecious crops, including yams and asparagus, require both male and female plants to produce viable seed. The stamens and pistils of cross-pollinatd crops often do not mature at the same time. Table 1. Classification of a few commonly grown vegetables as either self- or cross- pollinated. Though Table 1 classifies crops as self- vs. cross-pollinating, understand that insect or wind activity can cause some crossing to occur even in self-pollinated crops. Pigeon pea and sorghum, for instance, are largely self-pollinating crops; however cross-pollination can range from 5-40% (average of 20%) for pigeon pea and averages about 6% for sorghum (due to wind). Pollination patterns of some crops can be a bit confusing. Visitors to ECHO often ask about papaya for example. Trees of naturalized varieties of papaya found in most locations internationally are usually either male- or femaleflowered. This means there will need to be at least one female-flowered and one male-flowered tree present forfruiting to occur. The Hawaiian and Taiwanese varieties carried by ECHO, however, produce trees that are either female-flowered or that are hermaphroditic (containing both male and female structures in each flower; other terms for flowers with both female and male parts include “perfect” and “bisexual”). A female-flowered papaya tree will produce fruit as long as there is a tree nearby with hermaphroditic flowers. Dr. Lamb [at Tenom Agriculture Experiment Station visited by ECHO staff in Malaysia] said that if you plant seed from a hermaphroditic papaya, 1/3 of the trees will be female (F) and 2/3 will be hermaphroditic (H). At the research station trees are marked either F or H, then seed is saved only from the H trees. Hermaphroditic fruits bring a better price too. They are oblong with a small seed cavity compared to fruits of female trees which are round with a large seed cavity. This is in agreement with information by Julia Morton, author of Fruits of Warm Climates, which states that tying bags over bisexual flowers for a few days (to ensure self-pollination) will result in seeds that produce a population of plants with 67% of the trees being bisexual and the remainder female. Figure 4. Photos of atemoya: Receptive female flower stage (left; showing immature stamens), flower with mature stamens/pollen (center), and fruit (right). Atemoya is another example. Trees of this fruit species have flowers with both male and female parts. However, within a given flower, mature pollen production does not occur at the same time that the stigma is receptive of pollen (Fig. 4). Nevertheless, the stigma of a given flower can receive pollen (transferred via insect activity or dusted onto a receptive stigma by hand) from another flower on the same tree. It is possible, in the absence of reference books, to make an educated guess as to whether a crop is self- or crosspollinated. In self-pollinated crops, the male and female flower structures are often fused together in a capsule. This is evident in tomato and legume flowers. Flowers of self- pollinated crops are also, in many cases but not always, fairly inconspicuous. Flowers of cross-pollinating crops on the other hand often have large, colorful petals with which to attract insect pollinators. Low populations of bees or other pollinators. In this case, consider pollinating by hand. The concepts below are abstracted from a book by Carol Deppe entitled Breed Your Own Vegetable Varieties, The Gardener’s and Farmer’s Guide to Plant Breeding and Seed Saving. Most plants and animals are genetically diploid, meaning that each of their cells contains two copies of every gene. Much of our understanding of how genes determine plant traits comes from the findings of Gregor Mendel. From his observations, we know there are different forms of each gene. These gene forms are called alleles. Being diploid, a typical plant has two forms/alleles of each gene. In flower formation, the plant passes one allele to the egg (inside the ovary of a flower) and one to the pollen. Therefore, when pollination and fertilization take place, the fertilized egg produces a zygote that has two alleles of each gene (one from the pollen and one from the egg), giving different characteristics depending on which alleles the egg and pollen have received. Imagine, as did Mendel, that there are two forms of the gene that controls the height of a pea plant. One variety of peas consistently produces tall plants and another consistently produces short plants. If we denote the height factor using the letter T, we can describe the genetic makeup of the first (tall) variety as TT (a combination of one T allele from the egg and one T allele from the pollen) and the second (short) variety as tt (one t allele from the egg and one t allele from the pollen). Each of these varieties is said to be a pure-line variety because the two alleles of the height gene are the same for each variety (TT for the tall; tt for the short). In more technical terms, each variety is homozygous because they each have identical forms/alleles of the height gene. If a variety had a “T” allele from the egg and a “t” allele from the pollen, or vice versa, it’s genetic structure would be denoted as “Tt”. In this case, the variety is not “pure” and is heterozygous because the alleles of the height gene that it contains are not identical, and a Tt plant will produce a mixture of tall and short plants. There are whole books explaining genetics and the reproductive biology of plants in much more depth. For the purposes of this document, it is sufficient to understand that the brief discussion above helps to explain the behavior of inbreeding vs. outbreeding crops. Seeds of an individual plant, in a population of inbreeding-type plants, can be saved with a high degree of assurance that the resulting plants will maintain those superior traits. Five generations of subsequent seed saving are suggested to stabilize the superior traits. One does not need to save seeds from a large number of plants of a given inbreeding-type variety. As in the example above with inbreeding crops, imagine that two varieties of an outbreeding crop are crossed to result in a population of plants with the Tt forms of the height gene. As with the inbreeding crop, the result of a Tt X Tt cross is a generation that is ¼ TT, ¼ tt, and ½ Tt. The difference between inbreeding and outbreeding crops, in terms of the results of subsequent generations of crossing, is that nine kinds of crosses are possible with an outbreeding crop, whereas only three kinds of crosses are possible with an inbreeding crop. Since an inbreeding variety is self-pollinating, TT plants can only cross with TT plants, tt plants can only cross with tt plants, and Tt plants can only cross with Tt plants. With an outbreeder though, TT plants can cross with plants having the TT, tt and Tt combinations. Likewise, tt and Tt plants can each cross with other plants having any of the three combinations of alleles. If an outbreeding crop variety is allowed to cross freely over succeeding generations, traits are more or less stabilized as the loss of heterozygous plants from Tt X Tt crosses is balanced out by the number of heterozygous plants added by TT X tt crosses. Thus, heterozygosity is maintained but not lost. With excessive inbreeding (e.g. self pollination or crossing with very few plants), outbreeding crops tend to deteriorate, resulting in what is known as inbreeding depression. The opposite is true if they are allowed to cross freely and achieve a high level of “heterozygosity”. This latter tendency is called hybrid vigor. A high degree of heterozygosity is often associated with vigorous plants that yield well. For instance, if two open-pollinated varieties of corn are crossed, the resulting hybrid is usually much more vigorous than either of the parent varieties. Hybrid vigor and inbreeding depression are not fully understood, but it is clear that some cross- pollinating varieties are more susceptible to inbreeding depression than others. Cucurbits, for instance, have less hybrid vigor than corn but are also less susceptible to inbreeding depression than corn. An individual plant of an outbreeding-type crop has a high degree of heterozygosity, as there is genetic variability both within and between individual plants of an outbreeding crop. Seeds of an individual plant of an outbreeding crop, even in a population with a standard level of uniformity, can be quite different from each other and from the parent plant. So, if one saves and plants seeds from one superior plant, the chances are that the resulting offspring is not “pure”/”homozygous” for the gene(s) that made it superior. In maintaining the quality of seeds of outbreeding crops, during each generation of seed saving it is important to save seed from at least twenty or more desirable plants of crops like corn that are susceptible to inbreeding depression. It is possible to save seeds from fewer than twenty plants of crops (e.g. cucumbers, squash, and melons) with less susceptibility to inbreeding depression. Staff at ECHO are often asked about hybrid vs. open-pollinated seeds. Hybrid seeds are the result of crossing two distinctly different parent lines. Plant populations for each of the parent lines typically undergo rigorous selection for desired traits. When plants of these parent lines are crossed, the first generation of offspring - known as the ‘F1 hybrid’ - typically shows outstanding vigor, yield and uniformity. Unfortunately, when the seeds of the F1 hybridare saved and planted out, the resulting plants will not necessarily have the same traits as the F1 generation. In fact, this uncovers and shows the varied genetic mixture of traits carefully concealed during the inbreeding process. A number of commercial hybrids are marketed of both self- and cross-pollinating crops. For crops that are highly affected by inbreeding pressure, such as maize or brassicas, hybrids are more advantageous. There is less to be gained by making hybrids of self-pollinating crops or cross-pollinated crops with low inbreeding depression. Is it possible to save seeds of a hybrid variety? The answer to this is that the risk of producing inferior plants is less if the crop is a self- pollinating crop or a cross-pollinating crop with low inbreeding depression. Many hybrids being marketed will perform well only if the soil and growing conditions are optimal, translating to higher inputs of fertilizer, irrigation and pesticides by the farmer. Growing a crop like maize, the yield of which is significantly increased by hybrid vigor; again, hybrids of selfpollinators or cross-pollinators with low inbreeding pressure are less likely to be an improvement over good open-pollinated varieties. Producing for commercial markets demanding uniform traits such as fruit size and shape. There is a reliable and affordable source of the hybrid seed, or that seeds of the hybrid being promoted can legally be saved and the desirable traits stabilized over a few generations of seed saving. Open-pollinated seeds are derived from one parent population, and their offspring have the same traits as the parent plants as long as the parent plants are not receiving pollen from another variety of the same crop. Stability of traits over successive generations has an obvious advantage to the farmer or gardener who must save their own seeds each year. Seeds from open-pollinated crops are easily saved from year to year. For this reason, ECHO’s seed bank carries as many open-pollinated varieties as possible. In a development project, this would likely happen once a few crops/varieties have been evaluated in small plots and farmers have identified those they would like to try growing on a portion of their own land. In multiplying seeds of these “winners”, the first step is to plan when and where to plant. In planning the timing of crops, it is necessary to understand the crops being multiplied. Is the crop sensitive to day length? Some sorghum varieties, for instance, produce grain only when the days begin to shorten. Thus, an early planting date will allow for tall stalks that can support more grain while a late planting date will result in plants that set seed before the plants have reached their full growth potential. Other sorghum varieties are insensitive to day length which makes planting dates more flexible. What is the harvested product? If it is a fine grain like amaranth, or seeds in a leguminous pod like pigeon pea, time the planting so that seeds mature during a dry time of year. Otherwise, humidity can result in moldy grain unfit for seed saving. Utilize all the horticultural practices and inputs needed to grow the crop well. When experimenting to select suitable crops for a particular area, it is important to use only those inputs that local farmers have access to. In multiplying seed, this is no longer necessary because you already know that the crops being multiplied grow well under local conditions. If growing out more than one variety of a crop, it is especially important to label the locations in the field. Mark plots with labeled stakes in the field, and record plot locations on paper as well. This way, if plot stakes are pulled up or lost during weeding operations, there is a written plot plan/map to refer to. Remember the previously mentioned concepts regarding inbreeder and outbreeder crops, as those concepts will help you determine the number of plants needed to save seeds from to maintain superior traits. As a general rule, it is not wise to multiply seeds harvested from variety trials. In these trials, there is a high potential for crossing as the various varieties are grown in close proximity to each other. Instead, try and go back to an original source of seeds for the varieties you want to plant out. Before planting preliminary variety trials, it may be wise to keep some seeds back for potential multiplication purposes. Because maize is pollinated by the wind, a considerable distance is required to eliminate the possibility of crosspollination. In U.S.A. seed production, different varieties are isolated at least 180 meters, though the distance depends on normal wind velocity in the area. In South Africa varieties are kept 360-740 meters apart. Natural barriers such as tall trees are useful, and give extra safety in case of very strong winds. Often several rows of the same variety are planted around the field as “border rows”. The seeds from these border rows are used as food, but not saved for seed. A good general practice would be to harvest seed from the interior parts of the field if neighboring farmers are growing other varieties of corn. Also, the risk of contamination from pollen in neighboring field declines as the size of the seed production field is increased. Ability to supply secondary resources (e.g. in the tropics, stover of grain crops may be relied upon for resources such as animal fodder or kindling for cooking fires). In crops like beans, which may produce pods over time, collect seeds periodically as opposed to eating all of the pods produced early in the season. This will preclude the possibility of selecting for late-season pod production. Crops such as lettuce will tend to bolt (flower and set seed) in warm temperatures. In this case, it is best to collect seeds from plants that set seed as late as possible, after an abundance of leaves have been harvested. In fruit crops like tomato, look for plants that not only have good fruiting characteristics but also have healthy vines. The leaves on the vines provide shade to the fruit, preventing sunscald. Seeds that can be dried to low moisture content and stored for long periods of time are referred to as orthodox seeds. Examples include cereal grains and many kinds of vegetable seeds. Some seed banks will even freeze these seeds for long-term storage and preservation. Seeds of some plants, however, will die if they are dried and/or stored for any length of time. These seeds are known as recalcitrant and include many of the fruit crops such as mango, avocado, jackfruit, and carambola. Neem seed can be stored for about a month after which germination percentage rapidly declines. Papaya seed is more or less intermediate in that it can be dried and stored, but the seeds will quickly lose viability if subjected to freezing temperatures. Figure 5. Fermenting process of cleaning tomato seed. Photo by Joanna Lippmann, former ECHO intern. Here are some hints from ECHO’s own experience in cleaning and drying orthodox seeds prior to storage. Many of our seeds can simply be threshed or shelled and cleaned from debris by winnowing with the wind or a fan. In the case of hard-to-clean pulpy fruits, it is useful to break up the fruit, add water and ferment for 2 to 7 days before drying the seed. (Note: Placing seeds in water a few days after they are already dried may cause germination.) Examples of seeds that are fermented include tomato (Fig. 5), eggplant, pumpkin and squash. (Remember that the normal sequence in nature is for the fruit of such plants to rot (i.e. ferment) before the seeds germinate.) Fermenting seeds involves squeezing the seeds, with the pulp, into a container and allowing white mold to develop over several days. The mold degrades the pulp surrounding the seeds, which can then be removed from the seeds by pouring the contents of the container into a sieve or onto a screen and rinsing with clean water. Cleaned seeds can be placed on a cloth or paper towel to dry. Karen Ebey, a former ECHO intern, found an easy way to separate the tiny black seeds of lettuce from the fluffy material to which they are attached. She would place the freshly harvested material in the bottom of a cup and stir it vigorously with a fork. The seeds quickly settle to the bottom. Seeds can be treated in an antibiotic solution (10% bleach is good) for 2 minutes or more to eliminate bacteria and fungi from the seed surface. (Vinegar has some antibiotic action here. If vinegar is all that is available, you may wish to experiment on a small scale to determine how much you could use without reducing viability. If you use white vinegar, in many places this is actually glacial acetic acid, and not the fruit vinegars you may be used to, so it may be strong.) Seeds are then washed in clean water. Quite likely, a small percentage of the seeds will float and the rest settle to the bottom. The floating seeds are less developed and will be less likely to germinate. You will increase the overall percentage of viable seeds by removing the floating ones. If all of the seeds float, you will have to decide whether they were not yet ripe or whether that species of seed just happens to be less dense than most. Before seeds go into storage, dry the seeds in the sun or with any other technique or device you can use to circulate heated or reduced humidity air in/around the seeds to be dried. Reducing humidity of the air is the safest approach. If exposing seeds to sunlight or heated air, avoid subjecting the seeds to high temperatures. Harvested seeds at ECHO are dried for one to three days at less than 100 oF (38 °C), even though many orthodox seeds could probably withstand higher temperatures. According to the IBPGR Handbook (1985; http://www2.bioversityinternational.org/publications/Web_version/188/), it is best to reduce seed moisture content to 3-8% to enhance long-term seed storage. Although this may be difficult to attain in the tropics, it gives an optimum to strive for. An easy way to determine seed moisture content, without having to destroy any seeds in the process, is to use existing tables to predict equilibrium seed moisture content based on percent relative humidity (see Ch 3 of IBPGR Handbook mentioned above). When drying beans, a rule of thumb to test for adequate dryness is that when you bite down on a seed, no bite mark should be visible on the seed surface. If you notice bean or pea seeds splitting while drying, try drying at a lower temperature. Figure 6. 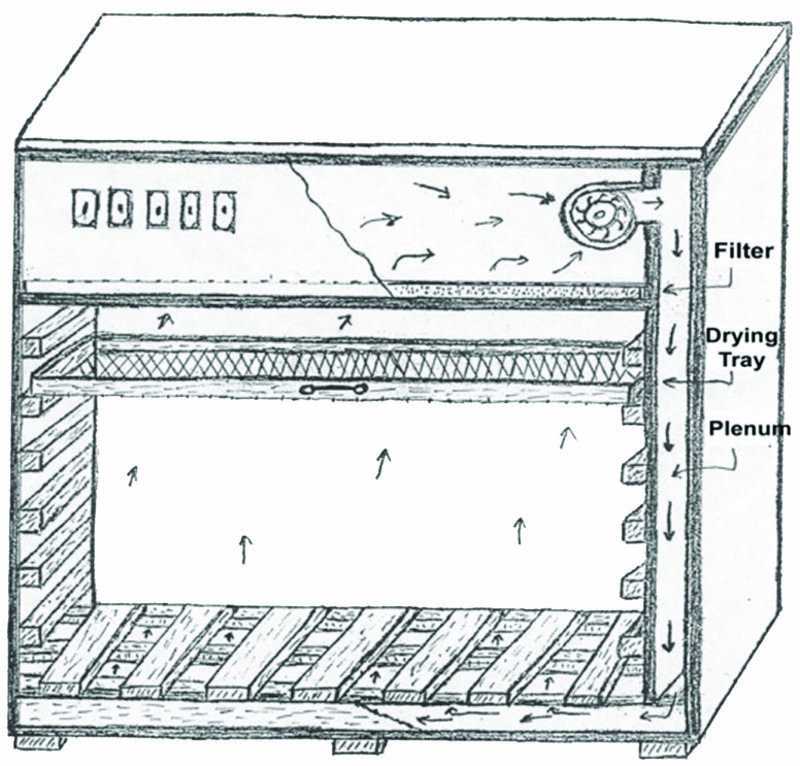 Diagram of a simple seed drying cabinet designed by Charlie Forst. A method used at ECHO in drying seeds is to use a drying cabinet (Fig. 6). Cabinet dimensions may be varied to suit the material you have to work with. It consists of two chambers. The upper chamber contains four sixty-watt incandescent light bulbs to furnish heat, and a radial or squirrel cage fan to produce air movement throughout the cabinet. The lower chamber is built to accommodate drying trays with wire mesh bottoms or bins or canisters with perforated sides and that can be stacked. The two chambers are separated by a fiberglass or other appropriate filter. The fan moves the heated air from the upper chamber into a plenum which encompasses one entire side of the cabinet. This plenum is approximately 2 in (5 cm) wide. The air moves downward and under the plenum wall. It moves under and upwards through a latticed floor, then upwards through the drying trays or containers, and finally through the filter into the upper chamber to be reheated and recirculated. Each light bulb contributes heat to the chamber and each is controlled by a separate toggle switch so that the amount of heat produced can be controlled. The fan is controlled by a separate switch. Do not make the top cover or doors hermetically tight. Air leakage (escape) is necessary for circulation, which helps control the humidity. 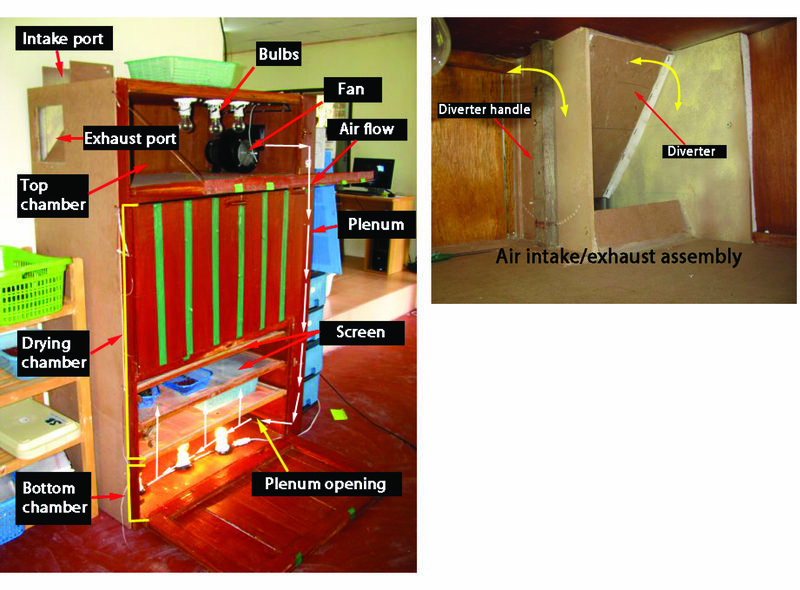 Using a modified design recommended by Joe Holley, Rick Burnette, Director of the ECHO Asia Regional Office, found that the drying performance of a seed drying cabinet operating under high ambient humidity could be improved by including intake and exhaust ports (Fig 7). By virtue of a diverter that can rotate, the design above allows for control over how much air is being recirculated in the cabinet vs. how much is exhausted outside the cabinet. With the diverter rotated all the way to the left, all of the air entering the cabinet can be exhausted. With the diverter rotated all the way to the right, all the air is recirculated within the cabinet instead of being exhausted to the outside. Exhausting all of the air outside the dryer helps control humidity, but the light bulbs may not heat the air to the extent that they would with most of the air recirculating inside the cabinet. If your dryer is placed in an air-conditioned room, where ambient humidity is low to begin with, you can rotate the diverter more to the right to increase temperatures and reduce drying time. Should the dryer be located in a non-climate controlled location, under excessively hot conditions, high temperatures inside the cabinet can be moderated by opening the diverter more to the left. Figure 8. 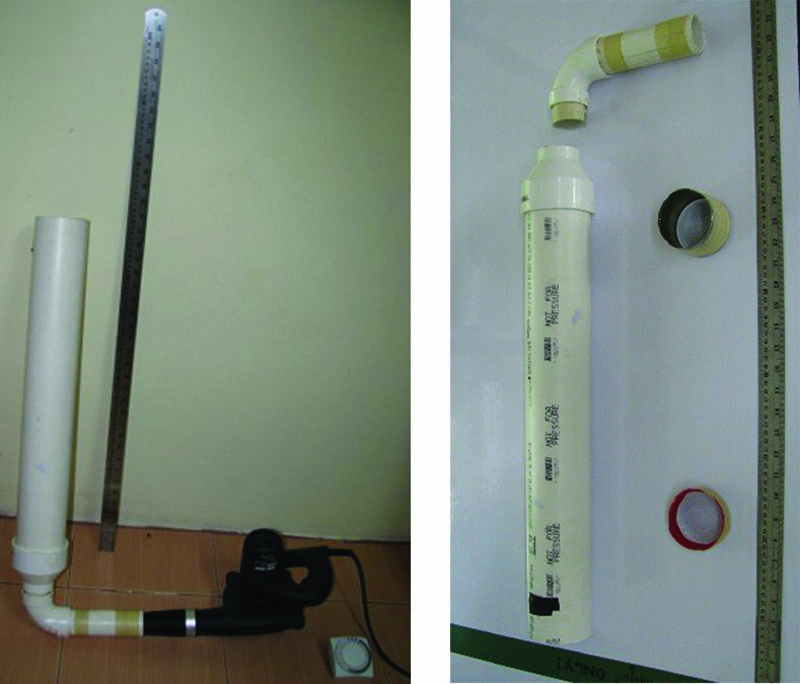 Method of drying seeds inside a PVC column using an air blower (left). Screens are shown (below), which hold the seeds in place within the PVC column. Joe, Rick and Abram Bicksler have also experimented with the use of a small air blower to achieve a high rate of air flow through batches of seeds held in place by screens in a 3-inch PVC column (Fig. 8). After one hour, seed moisture content, as measured by weight, declined from 45% to 9%. Although only one batch of seeds can be dried at a time, the benefits of such a unit include: simple design, fairly fast drying times, less space required for storage and operation and a relatively small amount of power required for the task.. 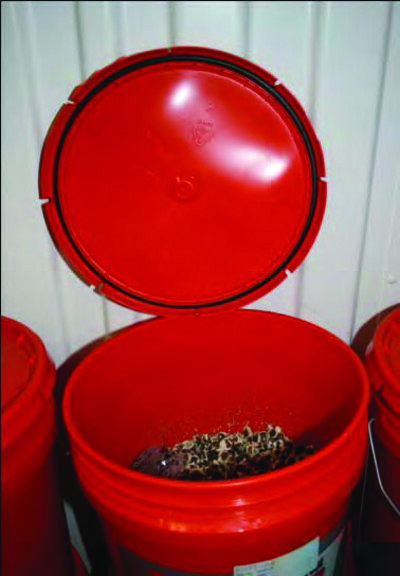 Seed moisture prior to storage can also be reduced by desiccants placed in containers of seeds. When used in this way, the desiccant will likely need to be replaced/recycled one or more times until the seed moisture stabilizes. See the section below on storing seeds for more explanation regarding the use of desiccants. To summarize, there are a number of options for drying seeds. Whether you use the sun, drying cabinets, air blowers, desiccants, or some other creative innovation, it should be possible to find a drying solution that fits most any set of conditions and constraints. Seeds that fall from a plant or are harvested enter a resting period. During this rest period, the seeds do not germinate until proper conditions are met; however, they are still alive. During dormancy, the seeds are still alive. They are undergoing cellular respiration, using up oxygen and stored sugars while respiring and releasing carbon dioxide. High temperatures can speed up respiration, adversely affecting the storage life of seeds. High humidity, especially when combined with high temperatures, favors the growth of fungal pathogens and subsequent rotting of seeds. The objective in storing seeds is to keep them alive in such a way that they use their food reserves slowly, remain viable for a long time and maintain energy for germination at planting time. Figure 9. 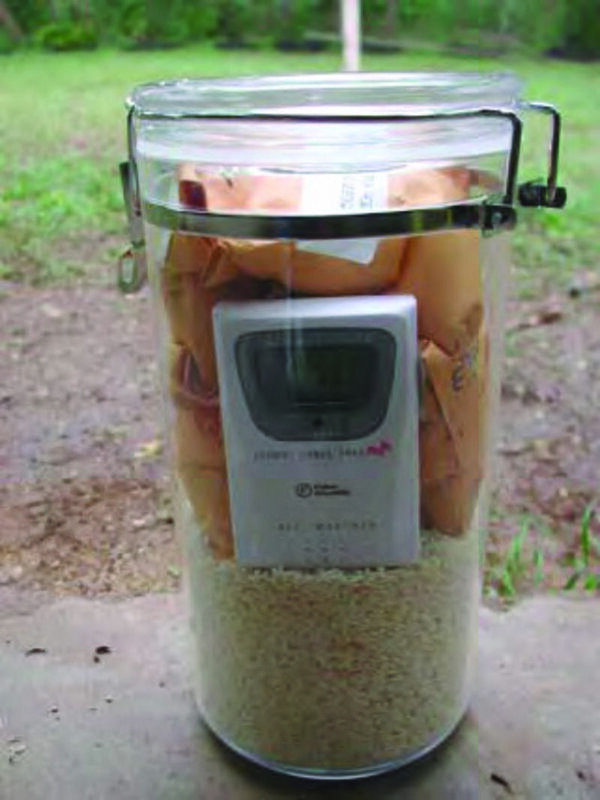 Dried rice inside a sealed container with seed packets and a wireless hygrometer (to monitor relative humidity; optional). Photo by Tim Motis. If the humidity of the entire room cannot be lowered that far, it is possible to store seed in airtight containers, with the seeds placed on top of a desiccant (Fig. 9). The desiccant will absorb excess moisture. Desiccants include charcoal, powdered milk, milled rice or other material which you have noticed absorbs water. To be effective, the desiccant must be free of moisture when initially placed in the container. In the demonstration pictured in Fig. 9, the rice inside the container had first been heated in an oven until it stopped losing weight. Allow the heated desiccant to cool in the container with the lid closed, to prevent it from absorbing moisture again before placing the seeds inside the container. A wireless hygrometer, shown inside the container, displays both temperature and humidity. To stabilize the temperature in a sealed container, place the container in the coolest part of the room (cement floor works well) that is in constant shade. Alternatively, bury the sealed container (which can even be PVC pipe with ends sealed, or a gourd) underground. In addition to the desiccants mentioned above, silica gel is an inedible substance that can be placed in a seed container to dry the air. Some silica gel products contain “indicator crystals,” which allow for a visual indicator of humidity. When the indicator crystals are blue, the silica gel is dry; as the silica gel absorbs moisture, the indicator crystals turn pink. Silica gel crystals that have reached their moisture-absorbing capacity can be recycled simply by heating until the indicator crystals turns blue again. Products with the indicator crystals are more expensive than silica gel without the indicator, but only a small amount of the indicator crystals is needed. Figure 10. 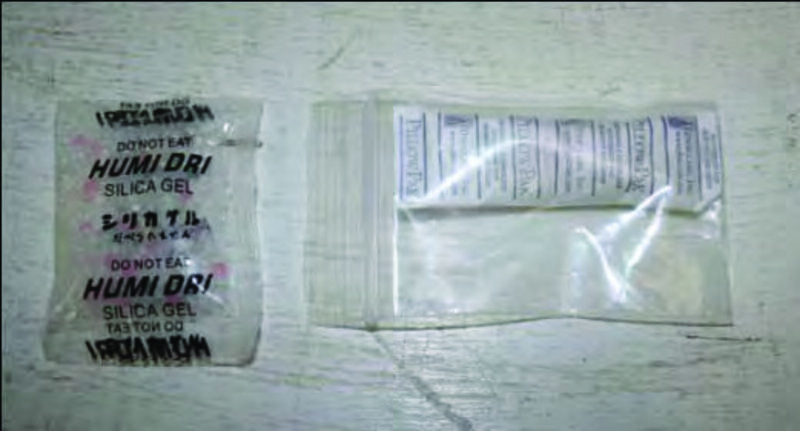 Examples of silica gel packets. The packet on the left contains colored indicator crystals. In the case of seeds placed over silica gel (with at least a few indicator crystals) in a sealed container, if the blue indicator turns pink in only a couple of days, the desiccant should be recharged (by heating as explained above) or replaced (Fig. 10). Once the indicator crystals have remained blue for 5-7 days, it can be assumed that the moisture content of the seeds is below 10%. Be aware that the indicator crystals in silica gel are not food safe! Do not allow the indicator crystals to mix with seeds. Figure 11. Plastic bucket used to store seeds. Choose containers that keep out humidity. Anything airtight will work. Examples include sealable Ziploc® bags or, on a larger scale for bulk seeds, plastic buckets (Fig. 11) or barrels with a rubber gasket on the lid. Clear plastic Ziploc® bags should be placed in a dark room or in a drawer or larger container that excludes light (to avoid heat buildup and pre-germination processes stimulated by light). Notice in Fig. 11 that there is a rubber ring built into the lid of the bucket. As long as the lid is tightly shut, this rubber gasket forms an airtight seal with the top of the bucket. If using a barrel, one could contrive a rubber gasket from old bicycle inner tube. As mentioned earlier, it is a good idea to place a desiccant inside the container. A layer of baked rice grains on the bottom of a bucket will help keep the seeds dry. A few packets of silica gel will do the same thing. Desiccants may need to be replaced from time to time. Paper coin envelopes work well for storing tiny amounts of seeds, but be sure to place them in a sealed container as they are not airtight. Label all containers to keep track of what is in them. Vacuum storage has been tested by ECHO with the aim of controlling seed storage pests, such as weevils, and also storing adequately dried seeds (ideally to 3-8% moisture content in a non-humid state). The reduced oxygen environment additionally maintains low humidity levels, slows seed respiration, reduces free radicals which destroy cellular functioning, and minimizes moisture fluctuations. One simple method of vacuum storage makes use of a vacuum lid sealer, such as a modified bicycle pump, to draw air out of a small hole pierced through the air tight lid of a glass jar containing seeds. The loose end of a partially attached piece of tape, positioned next to the hole in the lid, will fall into place and seal the hole when the PVC mouth of the sealer is detached from the lid. For more detailed instructions on how to modify a bicycle tire pump to draw a vacuum, see “Vacuum Pump Instructions” (https://ECHOcommunity.site-ym.com/?page=tech_notes; link listed under “Other Resources” at the bottom of the page). Another method of vacuum storage is to vacuum seal seeds into appropriate plastic bags using an automated vacuum seal chamber. ECHO Asia tested the effects of vacuum storage on a wide range of seeds with storage periods ranging from one month to one year. Vacuum sealed storage was more effective than paper packets in maintaining acceptable seed germination percentages over time. Their observations showed that, when storing seeds in a refrigerator, seeds in paper packets can absorb a significant amount of moisture. As mentioned above, if using paper envelopes or packets, place the packets in an airtight container. For more details on their research, see ECHO Asia Notes Issue 14 (http://edn.link/na7weq). Fungal pathogens, the most serious of which include Aspergillus spp. (A. flavus causes aflatoxins) and Fusarium spp., are discouraged by dry conditions. Bacterial pathogens need free water/high moisture and warm temperatures to proliferate. If seeds are stored using the “100 rule” described above, there should be no problem with fungal and bacterial diseases as long as the humidity does not exceed 65% to 70%. Some diseases, such as certain bacteria and viruses, are passed on to seeds via the mother plant or are present in a dormant state inside wounds/holes in the seed coat. These can then cause problems in the resulting crop after the seeds are planted. Carefully controlled hot-water treatments and various chemicals can be used, but these are probably beyond the scope of most small farmers. The best thing is to ensure that seeds are grown out well (timing seed maturation to occur during the dry season, and/or taking steps to control insects which can spread viruses, will minimize the likelihood of diseases being present in stored seeds) and that seeds placed into storage are disease free to begin with. Insects in stored seeds are not typically a problem for high-value seeds because, in dealing with relatively small amounts, it is possible to remove insects or use various treatments (e.g. vacuum) to remove insects. Heat and dry air in a seed dryer, like the one illustrated earlier in this document, will also kill caterpillars and soft-bodied insects prior to seed storage. In storing higher quantities of seeds, such as harvested staple grains, vegetable oils can be used to protect stored beans from bruchid beetle attacks. Steve Mason at Purdue University sent ECHO an interesting article on research done at CIAT in Colombia, which was inspired by an ancient Indian method. African palm oil or crude (i.e. unpurified) cottonseed oil was applied to dry beans, Phaseolus vulgaris, at a rate of 5 ml of oil per kg of beans, and tumbled at 35 RPM for 5 minutes. They were then infested with bruchid beetles, Zabrotes subfasciatus, at 1 day and again at 75 days. After 6 months the adults were counted. The untreated controls averaged 251 beetles, the African palm oil had none, and the crude cottonseed oil averaged 0.2 beetles per 100-g sample of beans. Treatment with 1 ml of oil per kg of beans was less effective (6.4 and 5.2 beetles per 100g). It is not clear how the oils work.They may have a suffocating effect on the beetles; dormant oil sprays on fruit trees are thought to interfere with respiration. Their action must be more complex however, because other work has shown that insects completely deprived of oxygen still live longer than those treated with oil. Other oils (purified cottonseed, maize or corn, purified soybean, crude or purified coconut palm) averaged roughly 75% reduction in the number of beetles, but this may not be enough for consumer needs. Cottonseed oil even reduced the number of beetles emerging when the oil was applied after the larvae had penetrated the seeds, but only from 650 to 387. The added oils did not decrease germination of the beans. Manual mixing of the oil and beans for 5 minutes in a glass jar was much less effective than tumbling, apparently because the surface of the beans was less completely covered. Crude oils are not only cheaper than refined oils, but also contain more antioxidants. These delay rancidity, which might affect taste. Of course, the treatments are not toxic. Based on prices of oil and beans in 1978, the oil would cost 0.5% of the market price of beans. technique is also important to reduce contamination and false results. Make sure to clean working surfaces, wash your hands, use sterile forceps and purified water will help to reduce fungal and bacterial contamination in your test. Ragdoll Method. Soak the sample of seeds in 10% bleach for two minutes (you can go longer for larger seeds like Moringa, curcubits, and beans), drain, and rinse with water. The seeds are next distributed onto a clean damp paper or cloth towel. This is then carefully rolled into a long cylinder and stored in a warm damp place. We have found that it works nicely to place the rolls in a tray that also contains a bowl of water. The tray and its contents are then enclosed in a plastic bag. Be careful that direct sunlight does not strike the bag or the contents will be overheated. Another idea would be to place one end of the roll in a glass containing a small amount of water. Be sure to label each roll. Record the number of seeds that germinate each day (or every two days, or whatever period you choose). Remember that seeds vary widely in the amount of time it takes to germinate. Some may germinate in 3 days; other kinds may take 3 weeks or longer. Calculate the percent that have germinated once it is clear that no more seeds are going to germinate. Petri dishes. Similar procedures, as far as sampling and counting, can be used for doing germination tests in petri dishes (Fig. 12). When using petri dishes, place the seeds on a piece of moistened (with clean, pure water to prevent mold) coffee filter paper cut to the shape of the dish. Monitor the moisture in the petri dish and add a few drops of water if you notice the filter paper drying out. We have found that the filter paper stays moist longer if some kind of tape is wrapped around the sides of the petri dish. Figure 12. Seed germination test in a petri dish (left) and soil (right). Soil. It is also possible to use soil (Fig. 12). This is a good approach for species that take over ten days to germinate. With these species, mold can become a factor when testing in petri dishes or paper towels. A germination test in soil also has the benefit of providing more of a true test as to seed vigor. A seed may germinate but not necessarily have sufficient vigor to push through the soil and produce a healthy seedling. At ECHO, we use plastic plug trays with one seed planted per planting cell. Egg cartons or other clean containers may be used if plastic plug trays are unavailable. more information on the seed germination cabinet and a step by step, photo-illustrated example of the “Top of Paper” method used (http://edn.link/wjg7kz). The California Rare Fruit Growers publishes a quarterly newsletter. One of the issues includes a table that lists storage life of seeds, type of storage that is needed, dormancy breaking requirement, days to germination, and cold hardiness. It covers 92 genera. It can be found online at: www.crfg.org/tidbits/seedprop.html. This is a good resource for answering such questions as whether one of you can produce your own onion or cabbage or tomato seed in your region and, if so, how. The book is in two parts. Part I covers general principles, such as development, evaluation, and choice of varieties, agronomy, drying, cleaning and storage, quality control and evaluation, and seed distribution. Part II covers specific crops (11 cereal crops, 6 drug crops, 6 fiber crops, 13 grain legumes, 8 forage crops, 10 oil crops, 9 tropical tree crops, and 22 vegetables. For each crop, typical subjects include climate and soil, planting and cultivation, nutrition and irrigation, pollination and isolation, diseases and pests, and harvesting and threshing seed.